In honor of Matilda Mae's special birth day! When I work I can listen to music. This is great because I am connected to the internet and I can use pandora and myspace to explore the music industry. 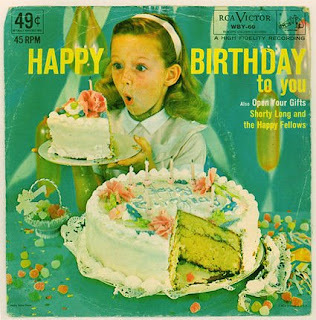 Such goodies I have found and in honor of Matilda's first birthday and my hopes in being the most musically influential aunt in her life, I want to share some of the great artists I have found. I would recommend looking up only their clean hits because I can not guarantee that all of these artists have the same standards as you. #1 on the hit list this week. "I'd Rather Be With You" Joshua Radin. #3 Bess Rogers "I don't worry" - the message is a lot like #2 kind of don't worry about the economy, everything is ok.
#4 Meiko "boys with girlfriends" all of her stuff is great though. she just did a concert with Joshua Radin in Phoenix and I was wishing I was there because they sound beautiful together. Those are the best of this week. I really like girl folk artists but I haven't really given boys a chance, but SJ has and she has shared her good news. Brett Dennen, Matt Costa, Andrew Bird. Also, say you like indie folk girl artists, check out the hotel cafe tour website from last year. Or there album from Christmas "Wintersongs" is super awesome but it isn't winter music season. But that hasn't stopped my listening. Here is a preview of Joshua. I think the scruff look is really working for him. Sick Sick Sick. Lindy and I went to Wendy's to celebrate the fact that we are done with finals. But guess what we realized waiting in line? WE ARE SENIORS. Is that sick or what? I swear I am not that old, but apparently 3 years at college gets you a senior status. Whatev, I guess I will be one of those super seniors forever because I don't even have a guesstimation about when I am going to graduate. Look, Lindy is really excited for my birthday. Welcome to the slideshow for my perfect weekend. My birthday fell on Easter this year and we celebrated my niece Tillie's birthday on the same day so it was quite the weekend of excitement! Me and Sis. Karren who is leaving Provo and heading to Brisbane, Australia on a mission! From left, sweet Kelli (SJ's cousin) who will be my room mate next year!, Em, Lindy, and Bethany -awesome girl from Jerusalem. 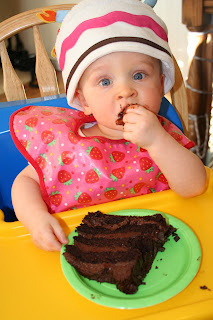 Matilda enjoys her All American Chocolate Cake! Like mother, like daughter. 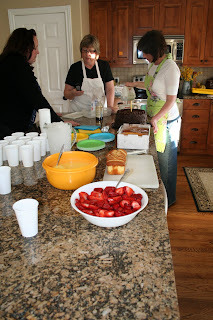 The women prepare all the delicious desserts for the special double birthday celebration. 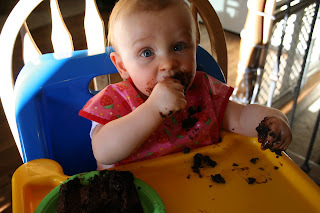 Melissa requested chocolate cake because she knew Matilda would really want it. But I think that Costco cake is a little too rich, so I opted for a pound cake with strawberries and fresh whipped cream. This is a little way of saying- Hey Lindy if you are going to take pictures like this on my camera, then be prepared to see it on the blog. He he. Ok now a real one, I think this was taken during pre-party jitters. Lindy came early and did karaoke so that I wouldn't be alone, in case no one showed up and to give me my awesome present and some hints at how to be an awesome 21- year old. More Jerusalem friends! Nathan and Mikelle and her room mate Emma. Now this was on the actual day of! Sarah Jane showed up on my birthday wearing the same jacket that I had just gotten for my birthday. We had gotten them on the same day in different cities. For the record, ths is the second time this has happened in our lives. Are we great room mates or what? Besides the twinner outfit, she also brought some great new tunes and the cutest plaid shoes I have ever seen! We had to take a big group shot with the combined family birthday party. We worried it would look like an outside-the-temple-after-the-wedding picture. It did, but uh here it is anyway. Wow OK lots of pictures! Basically to sum up the weekend- it was awesome. Truly it was a perfect combination of great friends, great family, and great food. Plus it was Easter- so extra special this year. Thanks everyone for making it great! Big big news. I was pretty excited when I found out that Melissa and Matilda were coming to Utah. And even more excited when I found out their flight would arrive on the night of my birthday (and easter) (yep it's coming up- good luck coming up with something great to give me :)). But to my shock, I saw Melissa and Tillie with my mom in the parking lot of JCW's. They came 2 weeks early! Good gift or what ?! Also, since I am home for a bit I was looking at old pictures of my life. And found this little beauty. Do I look like a sister missionary? Yes. Did I plan this? No. Plus, I remembered about some photos I took last summer. I was trying to be all artsy one night when I didn't have anything to do. I walked around Provo and took some summery shots and actually ran into one of my best friends from high school that I hadn't seen for several months. It was lovely. I rediscovered this beehive statue a couple weeks ago, and I love it! This is just so South of campus- so I love it, but Lindy it is ok. South of campus is not for everybody. :) Raintree here we come! Last summer, I was so obsessed with this complex. Every time I drove past I would look over so I could see all the pretty flower pots. Maybe it was a foreshadow of my future? Or maybe this photo was... creepy! I will live in this house some day. Love the plant, stucco, then stone look. Well those are all the pictures for today, I should probably combat the weather and go to school. Have a lovely Wednesday and look forward to beauty in Provo very soon.